Wow Vanityfair what a piece of crap article, people forget Apple was almost bankrupt at one stage. I'm not saying what Apple have done since then isnt amazing but lets face it Microsoft is hardly "flaming out in a ball of death" the way this article would have you believe. Once upon a time, Microsoft dominated the tech industry; indeed, it was the wealthiest corporation in the world. But since 2000, as Apple, Google, and Facebook whizzed by, it has fallen flat in every arena it entered: e-books, music, search, social networking, etc., etc. 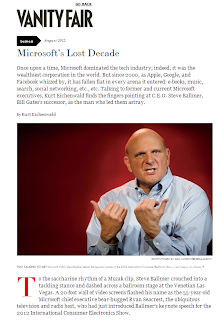 Talking to former and current Microsoft executives, Kurt Eichenwald finds the fingers pointing at C.E.O. Steve Ballmer, Bill Gates’s successor, as the man who led them astray. Microsoft’s low-octane swan song was nothing if not symbolic of more than a decade littered with errors, missed opportunities, and the devolution of one of the industry’s innovators into a “me too” purveyor of other companies’ consumer products. Over those years, inconsequential pip-squeaks and onetime zombies—Google, Facebook, Apple—roared ahead, transforming the social-media-tech experience, while a lumbering Microsoft relied mostly on pumping out Old Faithfuls such as Windows, Office, and servers for its financial performance. Anonymous hacks AAPT "user data"
Facebook screwing with the "formula"
Thoughts on extradition of Richard O'Dwyer?